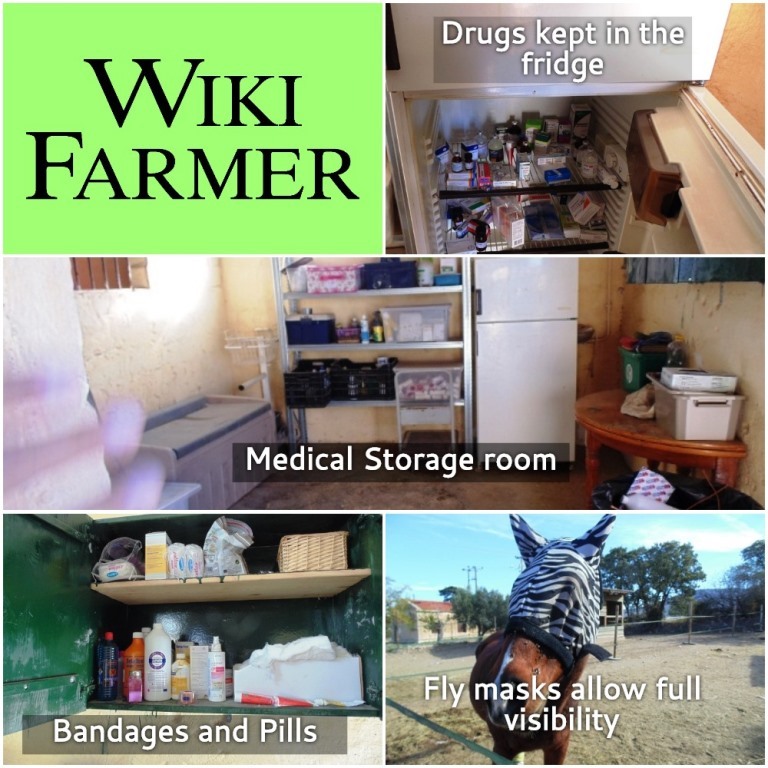 Since we have decided to raise horses, it is necessary to have an organized and tidy place, where we are supposed to store certain drugs and health aid kits for our animals. Sooner or later, we will surely need some of those products, and trying to find a specialized drugstore in the middle of the night -while our horse is suffering- is not a wise choice. In any case, we should always have in hand the telephone number of the nearest licensed veterinarian. Only if the vet cannot come to our property and only under his/her guidance should we use any of those products, especially the injections. First of all, we need to have a dry and clean cabinet, where the health aid kits and the pills will be stored. Secondly, we need a refrigerator, where we will store specific drugs. Povidone-iodine, bandages of various sizes, painkillers of different types, peroxide of hydrogen, penicillin and cortisone are the products that are most commonly used in case of injury or disease. We should consult our vet in order to form a list of products that we have to purchase before we welcome the horses in our property. We must also make a research about the 2-3 legitimate horse transport agents that are located in our region, in case our horse needs an emergency transport to a vet hospital. Furthermore, we must regularly check for the wellbeing of our horses. The most common abnormal conditions that appear in horses are constipation, colic and dehydration. Constipation is the horse’s inability to defecate (produce manure). If prolonged, constipation will result in greater health problems. Horses normally defecate many times per day. If we observe that one of our horses has not defecated for some hours, we can check right away if the horse suffers from constipation. Normally, when someone puts his ear in a healthy horse’s belly, he will hear the digestion procedure that sounds like a small factory. Thus, if our horse has eaten normally during the day, it does not produce manure and we cannot hear the digestion, we should call the vet as soon as possible. Other common symptoms of horses’ diseases are: not being able to stand up, sleeping all day and not eating or drinking water for some hours. In general, horses should be vaccinated and dewormed by a licensed veterinarian at standard time intervals and in case of emergency (e.g. a local epidemic). Read more on vaccination. We should also take care of our horses’ cleanliness. Grooming is a necessary procedure which promotes skin health while encouraging human and horse bonding. In special shops you can find horse grooming equipment (brushes etc.). There is no rule regarding the frequency of the grooming. Some horse owners enjoy doing it every day, as a way to communicate with their horses. Other horse owners groom their horses once in a week. Furthermore, in hot climates, during the summer heat, it is beneficial to wash our horses once a week with special shampoos. When the horses get older, their teeth may naturally grow unevenly. If left on their own, older horses will usually have health problems due to poor dental condition. Consequently, you are strongly advised to hire an expert, who will monitor and make the proper adjustments (floating) to the horses’ teeth at least once a year. Horse owners should also trim the horse hooves (with a hook trimmer) in order to prevent infections. We have to check their hooves every 2-3 days, but trimming should take place normally every 4-5 weeks. There are special shoes for horses that help them walk while preventing various infections. You can contact your vet in order to find suitable shoes for each horse. Horses often suffer from flies and various insects, which like to visit the area close to the horse’s eyes. In special shops you can find fly masks of various colors and sizes. 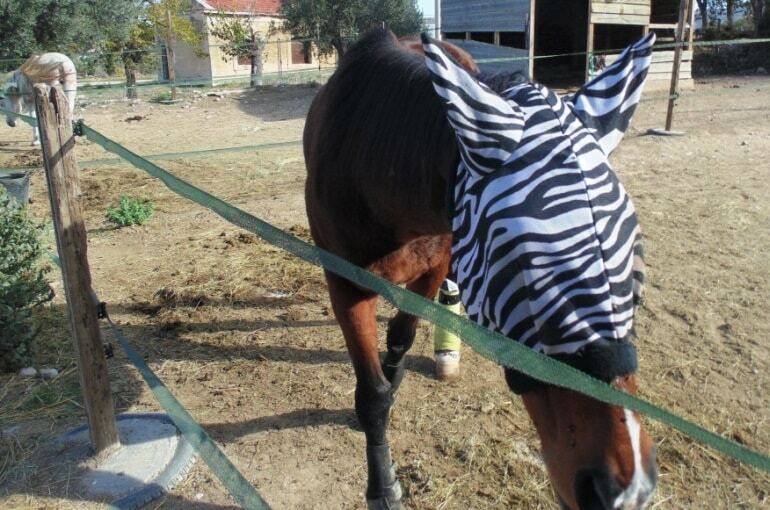 Wearing fly masks allows our horse full visibility and offers adequate protection to the face and eyes. You can enrich this article by leaving a comment or photo of your horse care methods and techniques.